Can a budget soundbar fill your living room? Sharp's debut effort is definitely at the budget end of the spectrum, a fact reflected in its comparatively limited feature list, but if you want a no-frills way of boosting your TV's sound quality then this might fit the bill. The Sharp doesn't offer any built-in audio decoding for Dolby Digital and DTS, but it does provide 32W of built-in 2.1-channel amplification and some sound processing modes. With its modest, low-key looks, the HT-SB200 doesn't dazzle, either, but the all-over black finish should complement any TV it's coupled with. It's also light and slim, which makes hanging it on a wall easy, but you can also attach the supplied feet and place it on your AV stand. Sandwiched between the two strips of speaker mesh on the front is a rudimentary display that shows the selected input or the volume. Around the back is a sparse selection of sockets that are not particularly helpful if you want to connect lots of components directly to the unit. You could hook up the audio output from your TV and channel everything through your display, but that means you'd have to turn on the set every time you wanted to listen to a CD. The feature list boasts a couple of interesting additions. Sharp's High Definition Sound Standard (HDSS) and SRS WOW HD team up and try to replicate a surround sound effect, plus you'll also find four sound presets for different types of content: Standard, Cinema/Game, Sport and News. Using the unit is simple. The supplied remote is small but the minimal button count and helpful placement stops it from being too fiddly. You get dedicated buttons for each sound preset and for altering the level on all four of the subwoofers. Bass and treble levels can also be adjusted, but that's as sophisticated as the tweaks get. At this sort of price we weren't expecting miracles, and sure enough there are some tell-tale signs of the Sharp's low-cost leanings. Fire up a frenetic action movie with lots of loud top-end effects and they can sound thin and abrasive through these speakers, lacking the level of control and smoothness offered by high-end soundbars. It also lacks any powerful bass. 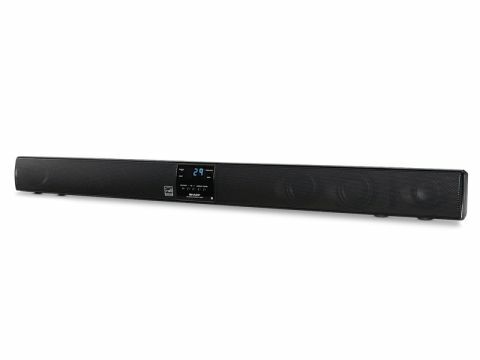 While those four subs make a decent contribution to the overall depth of the sound, low-end effects still lack the punch and solidity offered by other soundbars. As a result, epic action scenes don't have the necessary sense of scale. The limited reach of the pseudo-surround processing doesn't help matters, either. In the 'Cinema' mode, all of the action is confined to the front of the soundstage and none of the rear effects came near our seating position, let alone behind it. But then, an analogue stereo signal isn't exactly ideal for surround sound. But despite its lack of refinement the Sharp's sound is generally loud and gutsy, and it certainly offers a more exciting listen than any flatpanel TV we've ever heard. Plus, the same over-emphasis on treble that causes harshness on loud effects actually helps the Sharp to excavate lots of sonic detail from background ambience and effects during quieter passages. And although we bemoaned the lack of surround presence, SRS WOW HD does offer a pleasingly wide soundstage across the front with any type of material, giving it an open, expansive feel. Overall, the Sharp is an inessential budget performer.